George Bennie, an engineer and inventor, first announced his plans for a revolutionary new form of transport in 1921. Bennie had a test line for his Railplane system constructed during the next nine years over a quarter mile of railway sidings at Milngavie near Glasgow. 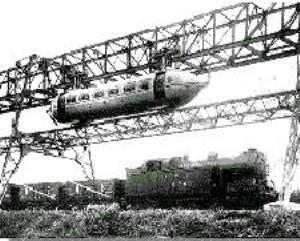 The Railplane was a form of monorail with a carriage held on an overhead track, which itself was suspended on a framework of steel girders, by front and rear grooved wheels. The carriage was driven by fore and aft aircraft propellers, powered by either a live electric rail or petrol engines, and braked by a system acting on the overhead wheels and by rotating the rear propeller in a different direction from the front one. 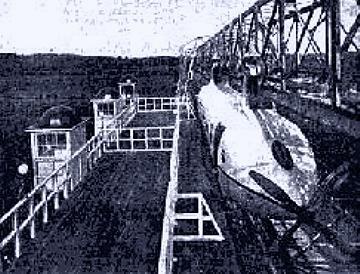 A rigid rail under the carriage prevented swaying. The white carriage was a streamlined cigar shape, to offer minimum air resistance, with "wonderfully appointed" and plushly fitted interiors, incorporating thick carpets, table lamps and curtained windows. A tiny elevated station platform gave access to the carriage that was fitted with sliding doors. The Railplane was officially opened on the 8th July 1930 when the Press and invited guests were taken for rides on the test line. One commentator noted that "the Railplane operated with perfect smoothness and passengers only knew the car was moving by gazing out of the window at the passing landscape. There was no bumping over rails, smoke or whistle shrieking. A ride in the coach is sheer delight." The Railplane attracted many visitors and transport engineers from many parts of the world. It seems that most were generally impressed by its potential as a means of safe and rapid transport. It was hailed as a "wonderful product of British Brains" and proposals for a Railplane line between Edinburgh and Glasgow were suggested. George Bennie was never able to find financial backing for further development of the system. He had invested large amounts of his own money in the construction of the test track and was eventually declared bankrupt in 1937. The track was demolished in 1941 to assist in the wartime scrap metal campaign and Bennie died in obscurity in 1954. 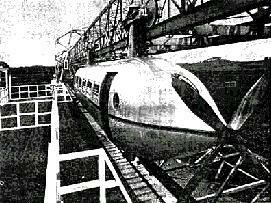 The Railplane, which lay rusting in a field at Milngavie, was sold for scrap in the 1960s. A model and short film showing the Railplane survive in the Glasgow Transport Museum.